Can I use Voice Recognition? Yes - you can use Siri to make entries directly into Vision Anywhere. Can I ring a patient directly from the app? Yes - where you see the phone button, and are using the iPhone, this will ring the patient. Can my Community Pharmacist use Vision Anywhere? Yes - see the guide for setting up the Community Pharmacist. How do I select a patient? From the Vision Anywhere front screen tap Search . The search patient box is displayed. See - Selecting and Downloading Patients. How do I view my Appointments for today? Tap Appointments Today from the Home screen. How do I view a patient record in Vision Anywhere? That's easy! From the Vision Anywhere Home screen, either select your next appointment, choose a patient from the appointments list or search for a specific patient using the Patient Search box. Once you select a patient, their Patient Summary screen displays. From here you can simply browse the patient record or add data. See - Viewing a Record. What is the Patient Summary screen? The Patient Summary screen is the initial screen which displays when you select a patient in Vision Anywhere. The screen provides you with a snapshot of all the essential clinical information you need. How do I search the patient's record? You can now easily search the patient's record. Type the term you want to search for in the search box. See - Search a Patient Record. How do I filter the patient's record? Selecting the Arrow button on the right of the category heading. Select which categories you want to filter. See - Filter the Record. How do I get back to the Vision Anywhere Home screen from the Patient Summary screen? 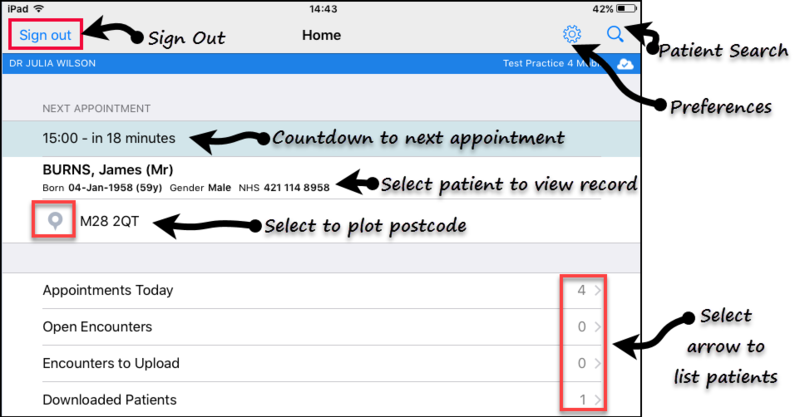 If you have just looked at a patient record without adding any data simply select the Search button to return to the Patient Select screen, here you can navigate back to the Home screen. If you have added data please remember to close your encounter. Encounters are the equivalent of Consultations in Vision 3. They are used to define and group data added during a patient consultation, for example acute medication, diagnosis and symptoms can be contained together within one encounter. This makes it easy to see what was recorded during current and previous patient consultations. How do I add an encounter? Open a patient record, and select the button. Record your consultation. See - Recording a Consultation. Select the Done button to close the encounter. Why do I need to close an Encounter? Any open Encounters remain stored on your local device, and cannot be accessed in any other setting, they are automatically deleted after 30 days. I'm locked out of my account, what can I do? Your system administrator can reset your password. See - Vision 3 Users . My device has been stolen - can I block this? Yes - your system administrator can block this. See - Licence Manager and Using Licence Manager. Can I change my Encounter and Prescriber warning messages? Yes - these can be changed in settings. See - User Preferences. Why can't I see my appointments? Vision Anywhere links to an appointment book associated with your name. If you need to make changes to your appointments set up, see - Vision 3 Appointments. The ability to access clinics or other clinicians appointments will be included in a future release of Vision Anywhere.